A Note from Chris Adams: Today, guest writer Kristi Glenn addresses how fear is a barrier to knowing God and His Word. Perhaps women fear God will not accept them if He really knows them. Maybe they fear being able to even understand Scripture. As leaders, we can help women crush the barriers that fear builds and show them how to really know Who God is through His Word. Fear can have a real impact on a person’s behavior. For example, I have always had a deadly fear of bees. As a child every summer there would be this one territorial bumblebee that would guard our garage door. I can remember watching him from inside the house as he whizzed back and forth while I weighed whether it was worth the chance of getting stung to try to pass by him and play outside. Fear of that one little bee managed to keep an active, outdoorsy child in the house on a beautiful, summer day. Fear makes people do funny things. Sometimes, fear curbs our behavior in a beneficial way. When we are afraid of getting burned, we don’t put our hands in a fire. Other times fear curbs our behavior in damaging ways. When we are afraid of getting hurt, we never truly engage in relationships. In leading different Bible studies and listening to some believing women, I’ve heard subtle hints of a fear of knowledge that has the potential for detrimental damage in the life of a believer. As we seek to lead others and make disciples, we must address this festering fear of knowledge both in ourselves and in the women we lead. Admittedly, women rarely voice that they fear biblical knowledge, but I hear things like, “God loves me and I love him, isn’t that enough?” or “I don’t want to be a pastor; I just love Jesus” or “I just don’t want to be too intellectual about my faith.” The problem is that it’s difficult to love intimately what you know very little about. My Friend: I’ve been dating this guy, and I think I want to marry him! Me: Ah! That’s so exciting! Tell me about him. Where is he from? My friend: Um, it’s either North Carolina or South Carolina. I can’t remember. Me: OK. What does he do? My friend: Well, he’s either an engineer or an account. It just slipped my mind. Me: OK. Well, what are his plans for the future? My Friend: Well, I don’t really know. I’m not sure I’ve heard him talk about it, but I really just love being around him. My fear is that sometimes we, and the women we are discipling, do this type of thing to God. We talk about how much we love Him and love to be around Him, but we actually know very little about Him. The Bible tells a different story. John 17:3 says, “This is eternal life: that they may know You, the only true God, and the One You have sent—Jesus Christ.” The word “know” in this verse isn’t simply a distant, intellectual knowledge, but a deep, intimate knowledge—the way a wife knows her husband. Life is found in this deep, personal, intimate knowledge of God. Biblical knowledge doesn’t just to fill our heads with knowledge about God; it fuels our hearts with a deep affection for God. Knowing God and loving God go hand in hand. In leading women to understand what the Bible says about knowing and loving God, we provide the balm for the festering wound of their fear. In love and filled with grace, let us put on display the beauty of knowing God both with our words and in our lives. Let us be women with a robust, biblical knowledge in our minds that fuels a deep, intimate love of God in our hearts, as we disciple others to do the same. Be sure to watch for Part 2 on Wednesday as Kristi shares 4 practical ideas to help lead women this way. Kristi Glenn is a Georgia native currently living in North Carolina as an MA student at Southeastern Baptist Theological Seminary. 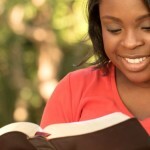 She is passionate about engaging and equipping women with the Word of God both in the U.S. and around the world.